Our experienced staff of engineers, designers and die makers starts with a concept and develops a solution to your manufacturing challenges. Using the most advanced 3D design technology and processes, we design and model the tooling that can successfully produce your parts. This cross-functional team then evaluates, tests, and verifies that the designs meet your tooling specifications and manufacturing requirements. 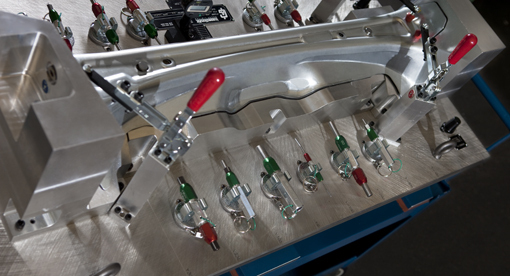 Once the design has been validated, the tooling is manufactured following Walker’s stringent Build Standards. Throughout the manufacturing process, all components are quality-checked against the design to verify that they meet the design requirements. Our experienced die makers utilize the latest technology and state-of-the-art equipment to manufacture the tool. We have the capacity to manufacture intricate tooling to your requirements. We specialize in manufacturing complex medium to large, line, transfer, and progressive tooling. High-end workstations and software for CAD operations. Whether it is complex tooling, prototype parts/tooling, or contract machining, each project is manufactured to the highest standards and Walker’s experienced staff will ensure the end result meets or exceeds your specifications.